Until 1974, thousands of statues remained to be unearthed on the archaeological site at Shaanxi province, where Qin Shih Huang (c. 221–210 B.C.E. ), the first unifier of China, was buried. For more than 2,200 years, these statues had been buried together with the Emperor in a massive city surrounded by two walls some twenty meters high (about 65 feet), and punctuated with gates on the northern, southern, western, and eastern sides and square towers at each corner. The excavation near Qin Shih Huang's tomb also uncovered four pits containing a total of nearly 8,000 figures. The soldiers are organized according to the military conventions of the time. In December 1987 the mausoleum was included in the World Heritage List by United Nations Educational, Scientific, and Cultural Organization. Emperor Qin Shih Huang, who was only thirteen years old when he became king of Qin, ordered an underground palace to be built as his burial place. horses assembled to protect him in the next world. Other sculptured animals include oxen, dogs, sheep, and pigs. Also, a clay soldier lies beside two iron cooking pots, two large ceramic soup bowls, and some smaller bowls. The figures are all impressively lifelike in their degree of detail. The arrangement of a tomb was not only an important life event but also a religious rite. Qin Shih Huang believed that some people could escape from death, either by living for a very long time or by being reborn in a new form. Therefore, he sent people to find drugs that would grant him longevity. He also prepared replicas of worldly goods to help him in his new life. People believed that if the spirit of the deceased were happy, it would intercede in the spirit world on behalf of its descendants and they would do well. 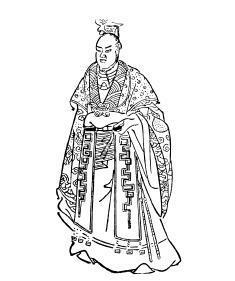 First Emperor of China, The. Produced by Ching-chih Chen. Santa Monica, CA: Voyager Company, 1991. Videorecording. Kern, Martin. The Stele Inscriptions of Ch'in Shih-huang: Text and Ritual in Early Chinese Imperial Representation. New Haven, CT: American Oriental Society, 2000. Lazo, Caroline. The Terra Cotta Army of Emperor Qin. New York: New Discovery Books, 1993. Li Yu-ning, ed. The First Emperor of China. White Plains, NY: International Arts and Sciences Press, 1975.